NGINX Plus provides consistent, always available, high‑performance application delivery and web services within your AWS Elastic Cloud Compute (EC2) environment. 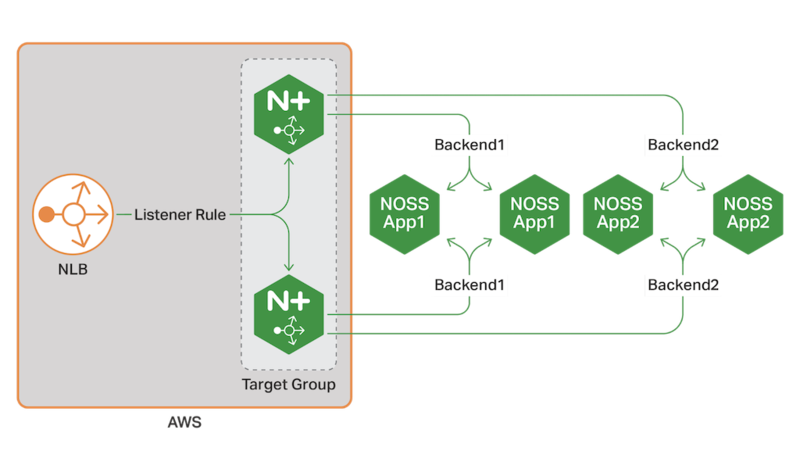 NGINX Plus can operate standalone or can integrate with AWS services – such as existing load balancing solutions, Auto Scaling groups, and Lambda – to reduce your application delivery and management costs. As with on‑prem deployments, NGINX Plus on AWS provides SSL/TLS offload, caching, and bandwidth and rate control to help you deliver content to your users in a predictable and secure manner. Deploy NGINX Plus directly from the AWS Marketplace, with either hourly or annual billing, across all AWS regions and in AWS GovCloud. Every NGINX Plus AMI includes access to NGINX’s award‑winning support. Create a complete AWS environment with the click of a button. The NGINX Plus on AWS Cloud Quick Start is a turn‑key solution for deploying a highly available and scalable application environment on AWS using NGINX Plus, AWS ELB, Auto Scaling groups, and Route 53. Move to the cloud without sacrificing high availability. With AWS NLB, you can now deploy a highly available, active‑active NGINX Plus cluster and stop wasting money on idle VMs. Combine NGINX Plus and Amazon Route 53 to create a global load‑balancing solution for your applications. Use Route 53 location awareness to send users to the AWS region closest to them. Use NGINX Plus in each region for load balancing and application delivery.